This heavy duty mechanical expansion joint has been added to our range of joints to facilitate the need for greater vehicular loading and increased durability where heavy truck use or turning restrictions dictate. Typical areas of use are multi-storey car parks, service decks, loading bays and bridges, where this system is equally applicable to new and refurbishment contracts, it’s versatility being able to accommodate existing finishes. The HD50 system features the double laminated Radflex 125 waterproof membrane bonded to the substrate, linking to the waterproofing on each side of the joint gap. The membrane is then protected by a metal reinforced rubber nosing which is anchored through the Radflex 125 into the concrete deck with A4 grade stainless steel chemical anchors. The butyl rubber compound formulation of Radflex 125 is tough, weatherproof and flexible, with proven performance worldwide. It is used in conjunction with Radflex epoxy adhesives designed for long-lasting bonding between the rubber and the substrate. The result is a continuous watertight finish throughout the structure. Steel and aluminium reinforced EPDM nosings are utilised to protect not only the membrane but also the edges of surrounding finishes from constant vehicular loads. The inherently flexible HD50 system is suitable for gaps of up to 50mm at mid temperature. It can accommodate rotational and vertical movement criteria of 6mm with lateral flexibility up to 50mm in a completely watertight joint. The inherently flexible S200 system is suitable for gaps of up to 50mm at mid temperature. It can accommodate rotational and vertical movement criteria of 6mm with lateral flexibility up to 50mm in a completely watertight joint. The component parts of the system are non-degradable, unaffected by UV light or ozone and completely impervious to water or water vapour. Once installed, the waterproof membrane is completely protected by the HD50 nosing, ensuring a long-lasting, effective flush surface expansion joint. Robust materials, straightforward installation and proven high performance together meet the exacting standards of the modern construction industry. Installation and use causes no ‘health and safety at work’ hazards, provided that manufacturers’ instructions are followed regarding adhesives, sealants and chemical fixings. Concrete surfaces must be float finished, abraded to remove laitence and provide good bonding substrate. If the concrete surface is unsound, it should be made good with polymer modified mortar, in accordance with manufacturers’ instructions. The concrete shoulders must be smooth and level across the expansion gap. We do not recommend application to lightweight or sand and cement screed. Mastic asphalt surfaces to which the Radflex membrane is to be bonded must be well sand-rubbed to remove nibs and excess bitumen fat to give a clean, flat surface free from surplus sand. satisfaction with the installation and system performance. Technical advice and design services are available from our Technical Department, including reviewing requirements of particular applications, ensuring installation of the most appropriate Radflex system to suit specific sites and applications. 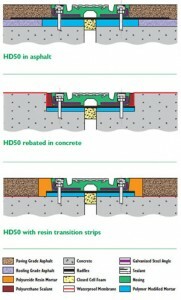 Radflex HD50 can be adapted to most types of construction. Continuity of the waterproof seal is ensured by bonding the Radflex membrane to the surface of the horizontal asphalt/concrete and to the face of skirting asphalt/concrete. The HD50 module is finished flush against the vertical detailing. 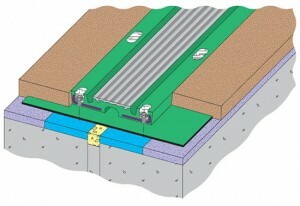 Internal and external corners can be easily accommodated with the Radflex 125 membrane. Radflex HD50 movement joint including Radflex 125 DLM x __mm wide, nosings, polymer modified mortar haunches __mm x __mm deep, adhesives, fixings and sealants. Supplied and installed by Radflex Contract Services Ltd.
(Tel: 01322 276363 / 0191 417 6677).